Yano Research Institute (the President, Takashi Mizukoshi) has conducted a survey on the domestic UPS (Uninterruptible Power Supply) market and has found out the product trends by segment, the trends of market players, and the future perspectives. 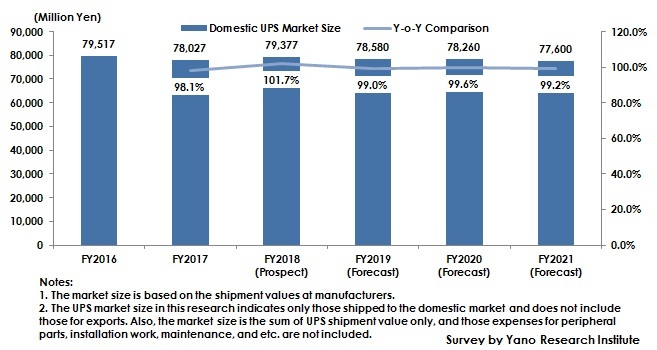 The domestic UPS market size in FY2017, based on the shipment values at manufacturers, declined by 1.9% from the preceding fiscal year to 78,027 million yen, but expected to slightly rise for FY2018 by 1.7% to reach 79,377 million yen. Although the demand to update large-capacity UPS with 100kVA or more for datacenters somewhat subdued in FY2017, the projects of building datacenters have increased one after another, newly generating the UPS demand. Such a strong demand for UPS for datacenters is likely to lead the shipment volume of UPS products to increase and more users to shift to large-capacity UPS, contributing to expand the market for FY2018. One of the characteristics of UPS is the small power losses (good conversion efficiency), which makes larger difference in cost as the capacity of UPS becomes larger. Some UPS with the capacity of 100kVA and larger have adopted low-loss expected SiC to improve efficiency, replacing the conventional IGBT (Insulated Gate Bipolar Transistor). On the other hand, because the products utilizing SiC require higher cost, the makers face a challenge of making a balance between efficiency (performance) and cost. In addition, UPS with the capacity of 100kVA and more requires more expenses for peripheral parts, installation work, maintenance, and etc. than those with smaller capacity. Some user companies wanting to suppress the initial cost strongly demands the expenses for UPS products to be as low as possible. In such a status, there has been increasing number of UPS products equipped with the parts that have extended the life durability, aiming to reduce the maintenance cost. An UPS (Uninterruptible Power System) in this research indicates an electrical apparatus that provides emergency power to the devices and systems to protect the devices and data within, when power cut or instantaneous voltage drop occurs. Note that voltage-dip compensators that can be available only for an instantaneous voltage drop are not included in this research. The UPS market size in this research indicates only those shipped to the domestic market and does not include those for exports. Also, the market size is the sum of UPS shipment values only, and those expenses for peripheral parts, installation work, maintenance, and etc. are not included.